The Disappearing Jabberwocky. 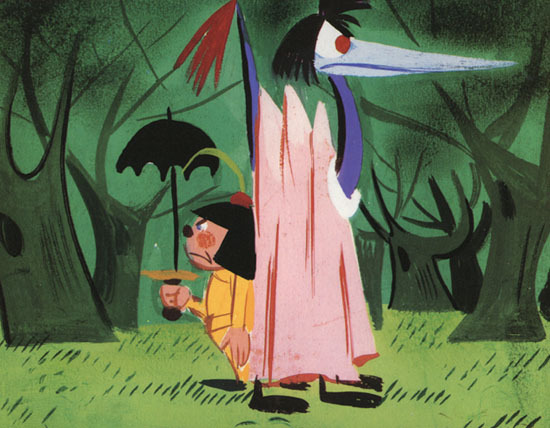 When the Disney Studio was making the animated feature Alice in Wonderland (1951), there was a planned segment about the dreaded Jabberwocky. Voice legend Stan Freberg was called in to do the voice. “I was directed by Walt himself and Ben Sharpsteen,” Freberg remembered. “There was some animation done, but Walt was concerned that the segment would be too scary for kids and it was pulled from the final film. I’ve never seen it but somewhere in the Disney Archives it still exists.” Original 1951 pressbooks for the film credited Freberg’s voice as the Jabberwocky. In 1992, Disney released a small book with concept art (above, probably by Tom Oreb) of the planned sequence. Want To Know A Secret? Disney’s animated feature Snow White and the Seven Dwarfs inspired a hit single almost three decades after its original release. In the film, just before Snow White sings “I’m Wishing”, she says, “Do you want to know a secret? Do you promise not to tell?” Well, those two lines inspired Beatle John Lennon to write one of the Beatles’ first hit singles in 1963. “Do You Want To Know A Secret?” Lennon’s mother would sing the Snow White songs to him when he was a child. The Nose Knows. According to producer Al Brodax who did the animated feature Yellow Submarine (1968) claimed that the Beatle most interested in the film and the series of television animated cartoons based on the Fab Four was drummer Ringo Starr. “His only complaint was that his nose was not long enough,” claimed Brodax, who also claimed that he was working on a sequel to the animated feature to be entitled “Strawberry Fields Forever”. That sequel was never made. From Animation to Acting. 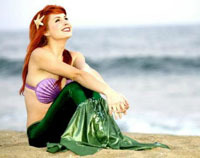 Many actors have early connections to the world of animation. Actress Beverly D’Angelo, the mother in the National Lampoon Vacation movies, worked at Hanna-Barbera as an artist. Roger Moore, before becoming The Saint and later James Bond, worked in 1943 at the age of sixteen at an animation studio in London called Publicity Picture Productions. His job was “tracing and filling in animation cels”. He was fired for making a mistake on a cel and serving his manager cold tea. Character actor John Dehner worked at Disney Studios in the 1930s because his dad worked there and got him a job. Actor Charlie Martin Smith who starred in “Never Cry Wolf” (1983) is the son of Paul Smith, the director of Woody Woodpecker cartoons. Jack Nicholson at the age of 17 worked as an office boy in the MGM animation department for Bill Hanna and Joe Barbera where he was soon offered work as an animation artist when they saw his drawing skill. He turned down the job to pursue acting. The Bullwinkle Puppet. When articles mention the short lived Bullwinkle hand puppet that appeared to introduce the 1961 NBC prime time “Bullwinkle Show”, they usually mention the time the puppet encouraged young viewers to pull off the knobs from their television sets so that the kids would be sure the TV was tuned to the same station for next week’s episode. Writer Bill Scott voiced the puppet as he did the character in the animated series. Around the same time, NBC introduced its famous colorful peacock as its icon to herald the fact of color programming. One night the Bullwinkle puppet tossed a puppet of the peacock into a pot and cooked it for dinner. NBC was outraged. What’s In A Name? At one time in the early 1990s, the Disney Company was developing and animated feature entitled “Silly Hillbillies From Mars”. One day, a Disney storyman saw the title of a Disney short, “The Martins and The Coys”. However, he misread the title as “The Martians and The Cows”. When the error was pointed out, it spurred the idea of feuding hillbillies from outer space. Star Struck. Many animated projects based on real movie and television personalities never get off the drawing board. Animation legend Jack Kinney at one point met with actress Mae West to put together an animated series to be called “Pretty Mae”. Next, he developed a pilot with comedian Bill Dana about Dana’s popular ethnic character, Jose Jimenez. Then, he worked with W.C. Fields’ son on an animated series about that fabled comedian. None of the projects ever got off the ground and sadly, today, I would bet today’s audience is unfamiliar with all three of those once popular personalities. Chaplin Fan. Walt Disney was a great fan of the work of silent film comedian Charlie Chaplin. Chaplin was also a fan of Disney. When Chaplin’s film “City Lights” was released in 1931, he insisted that it be shown with a Mickey Mouse short. The Colors of Money. According to Ross Bagdasarian Jr. in an interview with popular radio personality Dr. Demento in 1981, the very first Alvin and the Chipmunks album sold so well that Liberty, the releasing company, ran out of labels. That explains why different copies of the album have either, red, blue, green or black labels. Space Madness. Everyone in animation had to start somewhere. John Kricfalusi, creator of Ren and Stimpy, got his first taste of animation directing while working at Hanna-Barbera. John spent seven months in Taiwan supervising layout for fifteen episodes of the mid-1980s revival of “The Jetsons”. It was during this time that he got his first shot at directing with an episode entitled Hi-Tech Wreck (embed below). That Jose Jiminez short ended up being made by Paramount with the Modern Madcap short “I Want My Mummy” (1966). Yep, that’s definitely Kricfalusi’s hand! The 1957-1962 NBC Peacock opening was audibly a little on the pretentious side, opening with a J. Arthur Rank-like gong and then concluding with a dramatic fanfare. That’s the opening The Bullwinkle Show would have gotten in 1961, and it was definitely ripe for satire (the Peacock opening most Baby Boomers are familiar with, featuring the soothing wind instrumental, wouldn’t show up until the 1962-63 season. My ragged boomer memory recalls a peacock gag. The puppet said something about Thanksgiving and an offstage hand reached in holding a platter with a sorry-looking cooked bird. The puppet then said it was the NBC peacock. No pot involved. On “Ludwig Von Drake’s Adventure in Color”, the premiere episode of Disney’s NBC hour, a song ends with Von Drake shooing off a preening cartoon version of the network’s peacock. A gag publicity photo showed Walt looking genuinely ticked off at Von Drake, who had plucked a feather from the peacock to play Indian. That presumably was sanctioned. The show is on YouTube and the still is also knocking around on the net. One of the Snuffy Smith cartoons had Snuffy building a TV set. It didn’t have a picture tube or any other electronics, but it did have a live peacock to simulate the NBC intro. You probably remember it from 1969’s “It’s Tough To Be A Bird”. Just a small correction; Charles Martin Smith is Paul J. Smith’s nephew, not his son. But his father, Frank Smith who worked for UPA and other studios, was also an animator. Still it’s kinda fun thinking he came from a family of noted animators, yet went on an acting career such as running au naturel with the caribou and wolves, such a defining moment! While I know many of you enjoy these Animation Anecdotes columns each Friday, I was just communicating with Jerry and I told him what I really enjoy about the columns is all the additional information and corrections. I think it is important to get the accurate information out there. While I try my best to be accurate, sometimes when dealing with a multitude of oddball things like these anecdotes, I can only rely on how I heard the story because I can’t find another source. There are many more anecdotes on the way if you want them but want to thank all of you for all the additions and corrections. And of course, speaking of his cartoon-related connections, Charles Martin Smith directed the 1992 live action Boris and Natasha movie for Showtime starring Dave Thomas and Sally Kellerman. In addition to the Mae West and W.C. Fields cartoons, I have clippings about proposed cartoon series starring the Marx Brothers, the Ritz Brothers, Charlie Chaplin, and Buster Keaton. This was all during the period when the Three Stooges, Laurel and Hardy, and Abbott and Costello cartoons were produced. I also have a copy of an undated clipping announcing that National Telefilm Associates was negotiating to produce a new series of Betty Boop cartoons in color, which I thought was interesting. Presumably this was not referring to the redrawns. The Jabberwock appears in the Little Golden Book of ALICE IN WONDERLAND, thus there are also records that use the text and mention the character, but it’s just one sentence and one illustration. I always thought Bill Dana’s “Jose Jimenez” character was pretty funny when I was a kid, but I suppose it’s un-PC now? I do wonder what Bill Dana thinks about it all these years later (seeing he’s still around)? It must be something to go from being real popular to a nobody simply out of those particular issues. I suppose he had a good life otherwise.